While the United States prepares to reimpose sanctions on the Islamic Republic of Iran, the regime is rushing to piece together what remains of the nuclear deal discarded by President Donald Trump in May. Both countries have sent delegations to Europe and Asia to convince nations to either back or oppose the sanctions. Iran, however, is vastly out-leveraged in the matchup. The Iran nuclear deal was signed during the Obama administration by the five permanent members of the U.N. Security Council—the United States, Russia, China, the United Kingdom, and France—along with Germany. Before it was signed, it was criticized for unfreezing tens of billions of dollars for Iran, and for including time limits on clauses that restrict Iran’s nuclear program, thus allowing Iran to develop a nuclear weapon by 2026. On May 8, Trump announced that the United States would withdraw from the deal and reimpose “the highest level of economic sanction[s],” which were lifted under the deal. Two weeks later, U.S. State Secretary Mike Pompeo laid out 12 demands Iran has to meet for the United States to lift the sanctions again. Under the demands, Iran must stop enriching uranium, distributing ballistic missiles, and developing nuclear-capable missiles. It must release detained citizens of the United States and its allies and stop supporting terrorist groups and militias including Hezbollah, Hamas, the Houthis, and the Palestinian Islamic Jihad. Additionally, it must withdraw its forces from Syria and stop threatening U.S. allies, including its threats to destroy Israel and missile strikes on Saudi Arabia and the United Arab Emirates that the United States has attributed to Iran. The first sanctions to snap back on Aug. 6 include those on Iran’s automotive sector, and gold and other key metals trade. The remaining sanctions will return on Nov. 4, including those on energy and petroleum-based transactions, and transactions with Iran’s central bank. After Pompeo’s announcement, the State and Treasury departments sent teams to more than a dozen countries in Europe and East Asia “to build a strong global effort” to isolate Iran, including cutting its crude oil sales to zero, said Brian Hook, director of policy planning for the State Department, in a July 2 briefing. The Iranian economy is already feeling the squeeze. Its currency, the rial, traded at less than 10,000 to the dollar a decade ago. It now stands at over 43,000 to the dollar, while Iranians buy dollars on the unofficial market for well over 80,000 rials, Hook said. Over 50 international companies, particularly in the financial and energy sectors, have left Iran already, he said. Iran, meanwhile, is trying to convince countries to oppose and find ways around the sanctions. On May 23, Iranian Foreign Minister Javad Zarif sent a letter to his counterparts in other countries stating that Iran’s economic partners and the other signatories of the nuclear deal “need to ensure that Iran is compensated unconditionally” for the U.S. withdrawal. Zarif is fighting a PR war of sorts on Twitter, pointing to the United States’ spotty record of military interventions in the Middle East. “Those who live in glass houses shouldn’t throw stones,” he said in a June 28 tweet. Twitter is banned in Iran. In early July, Rouhani visited Switzerland and Austria. Swiss companies have served as middlemen for German businesses to sell dual-use technologies to Iran, a retired intelligence official previously told The Epoch Times. Dual-use technologies can serve a legitimate peaceful purpose but also can be used to further military objectives, such as developing nuclear weapons. He said the companies would disregard the security implications in order to sell to Iran. After the sanctions were lifted, European trade with Iran nearly tripled, reaching $25 billion in 2017, according to Statista. The United States has traded with Iran in a range of $200 million to $300 million a year. 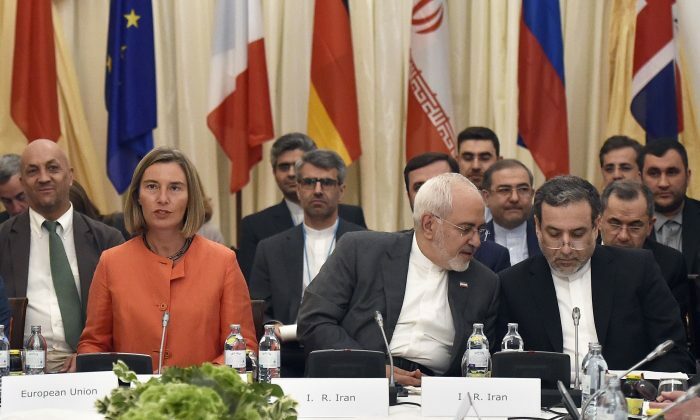 In addition to Europe, Russia and China have supported keeping the Iran deal alive even without the United States, but it remains to be seen how far they’ll be willing to risk getting sanctioned themselves by the United States. Pompeo already made it clear the United States doesn’t plan to issue exemptions from the sanctions, not even to European allies. Iran accused the United States of “bullying” and even initiated a proceeding against the sanctions at the International Court of Justice. But Pompeo said the 12 demands set “a very low standard” of behavior for Iran to reach.